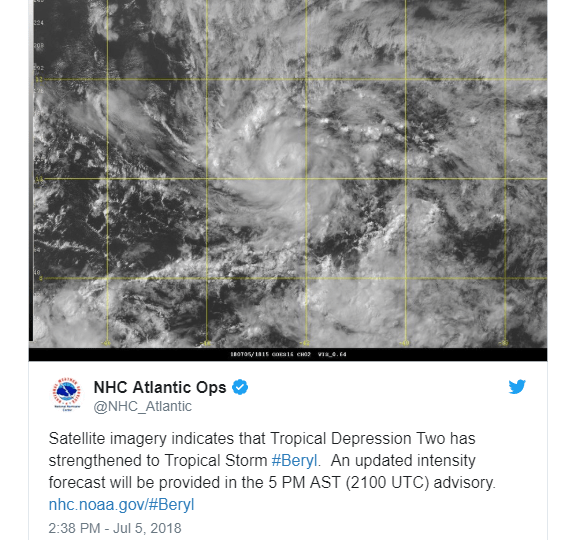 MIAMI — A tropical depression strengthened into Tropical Storm Beryl this afternoon, the National Hurricane Center said. As of 2:30 p.m. ET Thursday, Beryl had winds of 40 mph and was moving to the west at 16 mph. It was located about 1,330 miles east-southeast of the Lesser Antilles, a chain of islands in the eastern Caribbean Sea. 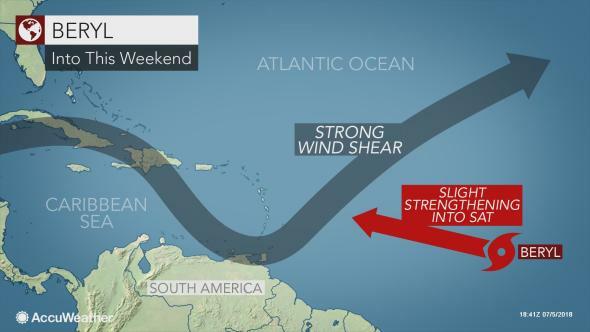 The storm should fall apart by the time it reaches the Lesser Antilles. That’s due to strong wind shear, dry air and dust, which should all combine to weaken the system, AccuWeather said. A separate storm could develop off the U.S. East Coast over the next few days, but isn’t likely to directly impact land. SENATOR FORDE: Who Will Answer For Black Flag Incident and $1.4M Fine at VIPA?